We’d love your help. Let us know what’s wrong with this preview of The Alpha Plague #1-3 by Michael Robertson. Equipped with nothing but a baseball bat and his wits, Rhys enters Summit City for a second time. His son wants his Mummy, and Rhys is the only one that can save her. If he can get to The Alpha Tower, he can release the shutters on all of the buildings in the city. Maybe then he can get his ex-wife and best friend out of there. However, to open the shutters will release chaos into the already wild streets. To make matters worse, an order to incinerate the city has been switched on. In five hours’ time, the complex must burn to a crisp. To give his son what he needs, Rhys has to risk everything. But there is no stronger love in his life than that which he feels for his boy. One final deep breath and Rhys re-enters hell. The Alpha Plague 2 is a post-apocalyptic action thriller. After having found and successfully rescued his ex-wife from the diseased Summit City, Rhys drags himself to where he should be meeting his son and discovers he isn’t there. Armed with nothing but hope, Rhys and his ex-wife set off on what they believe to be their boy’s trail. With just enough breadcrumbs to keep them going, they follow the path of their son and his protector in a race against both the spread of The Alpha Plague, and a crazed psychopath hell bent on their destruction. 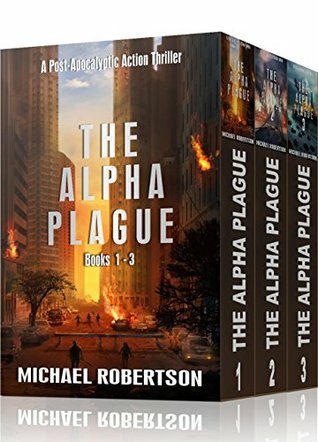 To ask other readers questions about The Alpha Plague #1-3, please sign up. I read lots of Zombie books. This is set in a future I don’t like. Not only is it sad to listen to the daily life, the government control is awful. The characters are all flawed humans that have to reach inside and pull hard to get through this day. I already got the next three in the series. I’m interested enough to see what happens next. Very interesting spin on Zombie Apocalypse. Read entire series besides the first three in the box set. It keeps you very interested in finding out how it will end. Ending took me by surprise, never thought it'd would end the way it did with one of the main characters. Definitely recommend reading. And just when I thought . . .
. . . Sam Sisavath had a death grip (pun intended) on the zombie story line, I’m delighted to say I was wrong. I’m loving these stories and I’m thrilled at having found another wonderful author to enjoy. Here’s to the zombie apocalypse! May it never happen. Rys is a strong man who loves his son dearly. He is learning what the infected are doing and he is afraid they are getting smart. The first three books are great. I will be getting the next three. Excellent read. Great characters, and a quick tempo make it difficult to put down! Robertson condenses and stretches time, appropriately and necessarily, to capture the first minutes, hours and days in a zombie apocalypse. Falling within the broader category of zombie apocalypses, this take is toward the rage spectrum of "28 Days Later" rather than the lumbering Walking Dead variety, which makes it all the worse for protagonist, Rhys. The entire trilogy barely clocks in at 2 days in character time. Wonderfully, the narration style morphs as time goes on and characters have mom Robertson condenses and stretches time, appropriately and necessarily, to capture the first minutes, hours and days in a zombie apocalypse. Falling within the broader category of zombie apocalypses, this take is toward the rage spectrum of "28 Days Later" rather than the lumbering Walking Dead variety, which makes it all the worse for protagonist, Rhys. The entire trilogy barely clocks in at 2 days in character time. Wonderfully, the narration style morphs as time goes on and characters have moments to consider their complicated pasts that overshadow their decisions and actions of the present. I've reviewed each book separately, too. The first book takes a few pages to introduce the main character, Rhys, and then -- all Hell breaks loose! The first two books are non-stop action that doesn't let up. The third book slows a bit to give some backstory for Vicky, who showed up in the first book. If you want a lot of thrilling action, then this series is for you. The major plot arcs are resolved for each book, but all of them end on a cliffhanger that paves the way to the next book. There were a lot of interesting developments, and The first book takes a few pages to introduce the main character, Rhys, and then -- all Hell breaks loose! The first two books are non-stop action that doesn't let up. The third book slows a bit to give some backstory for Vicky, who showed up in the first book. There were a lot of interesting developments, and wild twists that keep the stories exciting page turners. There was also some good character moments for Rhys. My problem was that maybe there was a little too much action, some of it pushing my ability to suspend belief. Rhys is not an athlete, yet he does things that would give an athlete qualms -- or at least a charley horse! Running up and down flights of stairs, making nearly impossible jumps... no amount of determination is going to make that possible if you're not in good shape. The high expectations I had for this series have been fully fulfilled so far. The characters are engaging and really well brought to life. There's The high expectations I had for this series have been fully fulfilled so far. The characters are engaging and really well brought to life. There's action, horror, mystery. And each new book has been shedding some light on other sides of the story. Or characters. Couldn't put it down till the end and immediately bought the next one. The story is intense and very riveting. Amazed that it all happened in one day. Will definitely continue to read this authors work.